Angelica has always been fascinated with history, from an early age her father introduced her to ancient history which then grew to a love for American history. 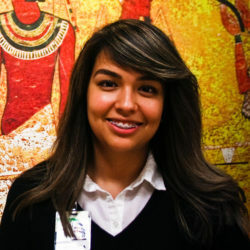 She currently studies at the University of Houston-Downtown where she is working on her dual degree for both US History and Education, Angelica plans to become a teacher in hopes to inspire the life of others like her teachers inspired hers. She loves to talk about history and gets a little carried away making references in everyday activities. Some of her favorite halls are, Hall of Ancient Egypt where she gives tours to the public, the Hall of Paleontology and the Hall of the Americas. Despite her love for history she’s like a kid in a candy store when it comes to frogs and dogs.